Brown, John (1800-1859) Autograph Note Signed and Endorsed Check, 1 December 1859. Brown, John (1800-1859) Autograph Note Signed and Endorsed Check, 1 December 1859. 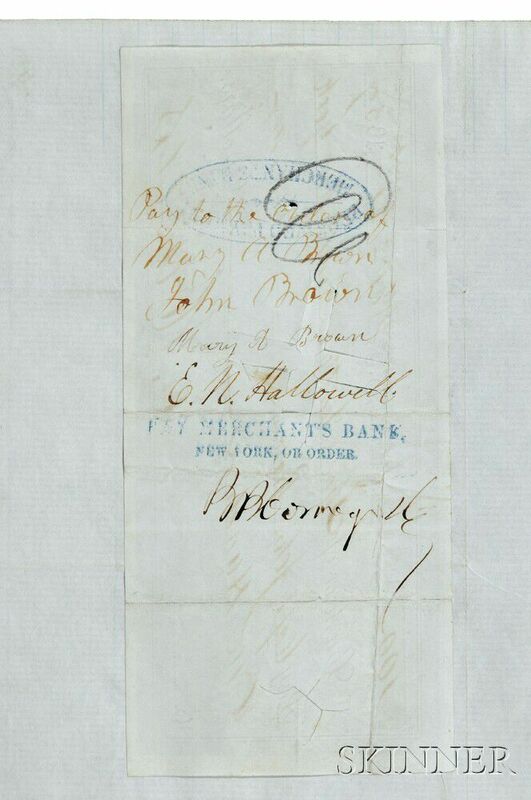 Single page of lined paper, inscribed on one side, the original check set into the same sheet, a window cut in the letter to accommodate the check, with John Brown's endorsement, naming his wife and son on the verso, and Mary Brown's signature. 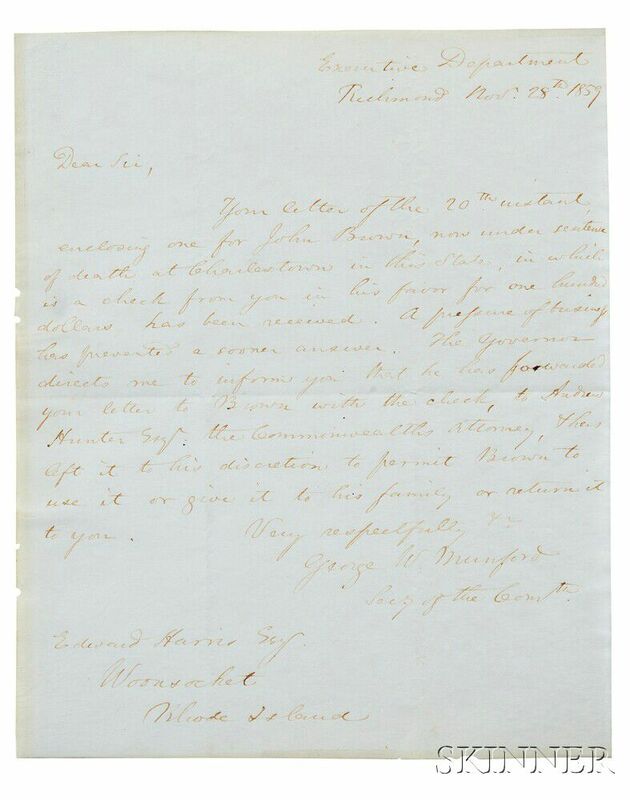 The letter addressed to Edward Harris (1801-1872) of Woonsocket, Rhode Island, thanking him for sending a check for $100. Also included is a letter from George W. Mumford, Secretary State of the Commonwealth of Virginia, acknowledging receipt of the check; ink faded on the rectos of both letters and the check, all three documents matted and mounted together in a double-glazed frame. Brown wrote this note from prison in Charles Town, Virginia on the night before his execution. 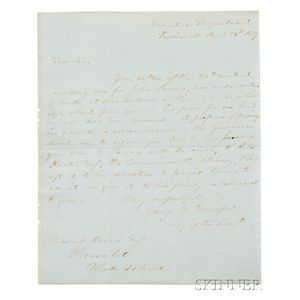 "My dear Sir, I only have time to say that your most kind & comforing [sic] letter of the 20th inst. enclosed Draft for $100, One Hundred Dollars & copies are received & to return you my earnest thanks. May God Allmighty reward you a Thousand fold. Your friend, John Brown." 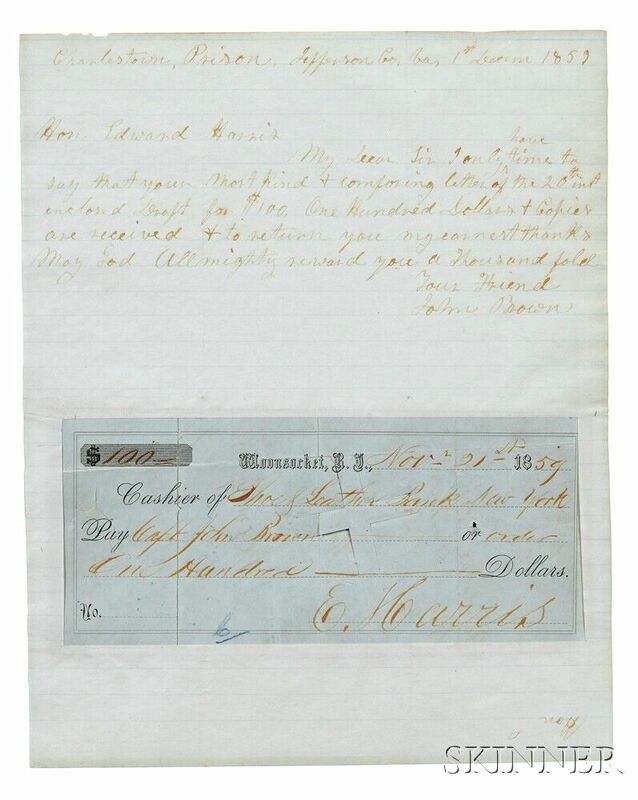 Brown also refers to the receipt of Harris's check in a letter to his family dated 30 November 1859. Brown was executed by hanging because of his participation in radical abolitionist activities that included arming enslaved people in an attempt to overthrow the practice of slavery in the American south. On 2 December 1859, he became a martyr for the abolitionist cause.